Enter your number of teams and how many games each team should play (in total) over the course of how many weeks (not counting off-weeks). If you have 10 weeks in your season from June through August and you want to skip the week of the 4th of July, thus making your season 11 calendar weeks long, enter this as 10 weeks, then use the Dates button on the next screen and shift the week of July 4th down. Say you have 9 teams. Each team should play only once each week with 1 team getting a bye. Enter this as 9 teams with 8 games in 9 weeks. If you have 7 teams in that same scenario, enter 7 teams with 6 games in 7 weeks. Enter your fields/courts/tables/whatever you call it in your sport. Tip: To keep things easier when entering time slots, include changeover time between games at the same field. Shift week 1 to change when your season starts. Shift weeks in the middle to create off-weeks, e.g. for holidays. You can also edit your season start date by clicking on the date under Week 1 and selecting YES when asked if you want to change the start date and shift all games. When do your games take place? e.g. Monday from 6-10pm at Grand StreetIf your times vary each week, check out PRO. LITE only lets you enter times for all weeks. 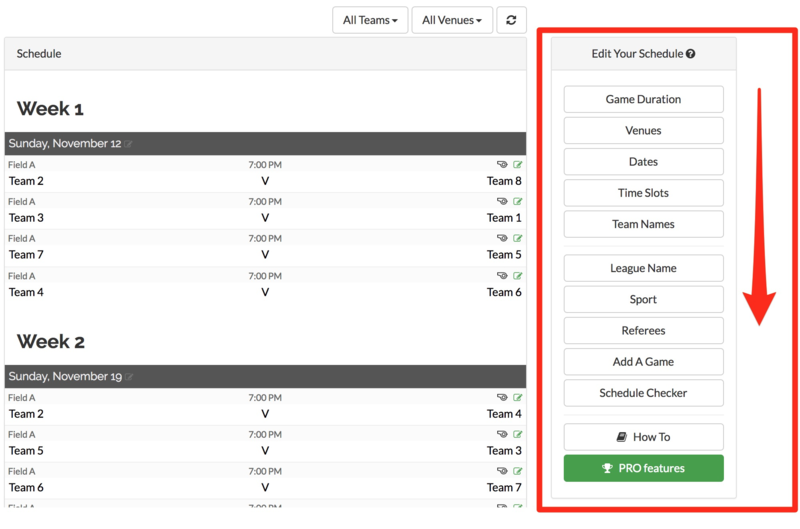 In PRO, you can select to which weeks a time slot applies. Here's where you change the title that will show up at the top of your schedule and in the URL. Upload a logo and choose an accent color for your public schedule page. This is mainly to determine your standings type. Enter the names of your referees/umpires/officials. After a page-refresh, you'll be able to assign them to games (look for the whistle on each game after you've entered at least one referee). Add any additional games by hand. See how many times each team plays against each other, how many times each team plays at each time and at each venue. See what other features are available if you upgrade to PRO. This button just opens a dialog with a list of features. To upgrade to PRO, click the Upgrade button at the bottom of that dialog. You can try all PRO features without a credit card. A subscription is only required once you're ready to publish your schedule. Click PUBLISH SCHEDULE at the bottom right in order to make your schedule visible to others at the Public Schedule link. LITE is free for up to 25 teams (with ads), you may pay to remove the ads – you'll see the option when you publish. Click the SHARE button at the top to see your options for getting your schedule in front of people. Give your schedule the final touch by making manual adjustments (click to read article on that).